On August 1, 1971 Jim & Cleo Vickers purchased a small grocery store in Newport, Oregon, moving there with their four children. The store was located next to the current store, facing north. Jim had over 23 years in the grocery business and had a dream to own and operate his own store. He believed in service and being an active part of the community. These ideas were well accepted and Jim & Cleo grew the business to the current JC Market location in 1979. Today, JC Market is continuing the Vickers' family philosophy of service and community participation with daughter, Diane Vickers Mattson, son, Steve Vickers, and manager, Lyle Mattson (Diane's husband) overseeing the store's operation. Locally owned and operated to the highest standards possible is JC Market's ongoing goal. 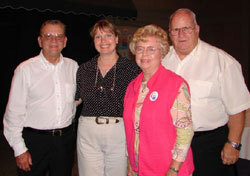 2nd generation Diane & Lyle Mattson (on left). And We Grew . . . In 1991 the current JC Market store site was expanded from 20,000 sq ft to over 35,000 sq ft. This expansion added a wider range of products and departments, offering more selection to our customers. The store has continued to add services and products over the years to stay current with our customers' needs and desires. Jim & Cleo Vickers also founded JC Market of Toledo, Oregon in 1975, which is owned by the 2nd generation Vickers family. In addition, they purchased a store in Florence, Oregon, in 1980 and later sold that store to their daughter, Linda Owen, and her husband, Mike. 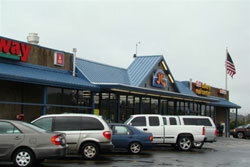 In October 2000, JC Market partnered with Thriftway Stores for their marketing and advertising services. Our weekly ads and the coupon book come from Thriftway Stores. JC Market is still locally owned and operated by the Vickers family. 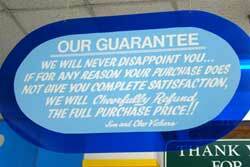 we will cheerfully refund the full purchase price."